Bracing gives the structural steel frame rigidity. 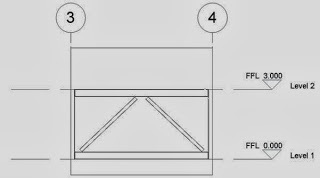 To add cross bracing to our structure we need to use our bracing tools under the Structure Tab on the Ribbon. With the bracing tool selected we need to be able to select on the correct points when placing the cross bracing. Cross bracing is probably most easily added in framing elevations. We execute the command and then tell Revit the locations we would like the beams to join or snap to. 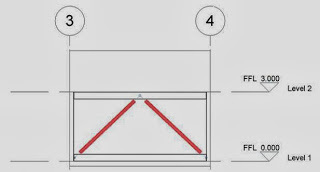 In Fig 2 below two cross braces have been placed in a framing elevation view. Even though end point snap points were used the two braces are missing the corners. Select the two cross braces and you will see two little blue circular markers as illustrated in Fig 3 below. We can use these markers to extend the braces to the corners of the structural frame. Click on each blue marker in turn to correct cross bracing location. Your cross bracing should now resemble Fig 4.